Have you ever thought about all the assets necessary for your organization’s IT environment to operate? Or where they come from, when they’re replaced, or where old assets go? How about who strategizes and executes the various processes involved in managing and tracking these assets throughout their lives? Organizations that position themselves for scalability have likely given these considerations ample thought. After considering their business goals and assessing their current IT environments, successful companies often decide to implement an Asset Lifecycle Management (ALM) strategy to ensure their assets are available, optimized, and properly maintained throughout each phase of their lives. While deciding to enact an ALM strategy is a significant step toward achieving the various business benefits ALM provides, it’s equally important to follow the best practices of effective ALM. The procurement phase involves identifying which assets are needed, determining when and how they will be obtained, and submitting a purchase order (PO) to the appropriate vendors. There are a number of factors that inform asset purchasing decisions such as the health of assets currently in use or the number of upcoming new hires who will need to be provisioned equipment. During inbound services, organizations receive asset shipments at their warehouses and verify that the shipment aligns with their purchase order. In the ensuing outbound services, the assets are tagged for tracking and sent out to their appropriate destinations. 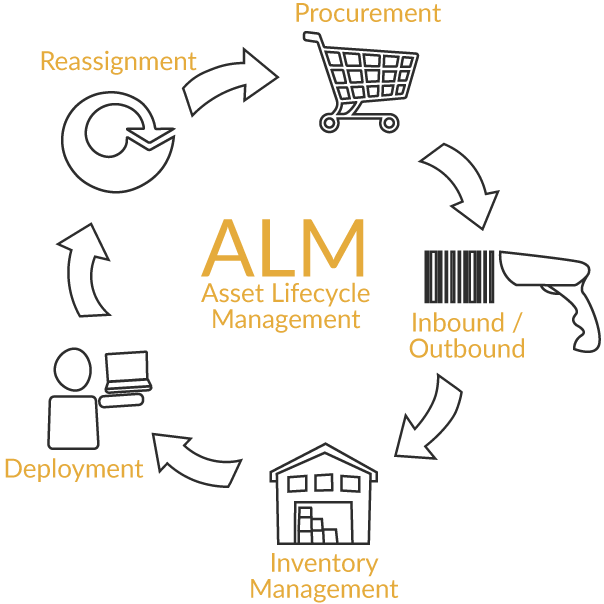 As a part of inventory management, assets that are not yet ready to be shipped out to their destinations are stored, maintained, and logged into an asset management database. With effective inventory management, assets can be efficiently retrieved when they’re needed in the future, and asset inventory levels are maintained and logged in the database so that there is never too few or too many of any given asset on hand. The deployment phase begins when assets are requested and ready to be retrieved from their on-site inventory. During this phase, assets are configured for end-user readiness and set up at employees’ desks with all necessary accessories. Reassignment is the final phase in the ALM process which takes place when a user no longer needs the asset he or she has been provisioned, or the asset is determined to have met the end of its useful life. At either one of these points, the asset is retrieved by IT and designated for repair, donation, or decommissioning and disposal. With efficient and standardized ALM processes in place, organizations ensure that the IT assets their business relies on remain optimized, secure, and readily available. There are a number of key fundamentals that must be in place to ensure successful ALM. These strategic and proactive best practices are the ones that organizations can use to turn ALM into an operation that drives business value and positions them for continued scalability. As organizations grow, implementing asset management software to log and track asset information becomes increasingly essential. By generating unique serial numbers for individual assets and logging them in to a regularly updated database, companies can track every update that’s made to an asset from its status to its current location. Asset management software also prevents asset waste and shortages by tracking which assets are provisioned to which employees, ensuring that inventory min/max levels are maintained. Organizations might also implement a configuration management database (CMDB) to track configuration items (CIs) and the information they transmit in relation to one another, or purchase order software to track POs made for new assets. Governance entails establishing clear roles, responsibilities, and procedures for all ALM processes to promote efficiency, security, accountability, and organization throughout the operation. By identifying key parties involved throughout ALM and the people who will oversee the execution of the necessary processes, organizations can ensure they have clarity surrounding their ALM practices. Defining governance also involves the creation of standard operating procedures (SOPs) and runbooks to document key responsibilities and methodologies, as well as training materials to ensure that employees’ transitions to new technologies are seamless. When it comes to the partnership between Service Desks and ALM teams, established guidelines regarding ownership of specific duties is key. While ALM teams are responsible for providing Service Desks with the assets they will eventually deploy to end users, who is responsible for configuring this equipment so that it is user-ready? Likewise, organizations often have a dedicated data center ALM team, so it’s important to establish and document hand-off points for the delivery of servers to data centers to avoid overlap between the tasks performed by different personnel. When roles and responsibilities are established clearly, ALM processes are executed properly and efficiently. Continual auditing and forecasting is another key fundamental of a proactive and scalable ALM strategy. By monitoring and anticipating equipment health and lifespans, ALM teams can make strategic asset purchasing recommendations to their organizations and suggest policy revisions regarding how long employees should have specific assets based on their rates of use. The same kind of predictive methodology can also be applied to cost modelling. By performing regular cost analyses and regularly communicating with other departments like HR, Events teams, or Data Center Ops, ALM teams can help their organizations forecast future expenses in anticipation of asset volume surges during intern or new-hire seasons, or volume dips during off-hiring season. Through these forecasting and auditing best practices, strategic ALM promotes significant cost savings. A successful ALM operation necessitates partnerships between ALM teams, other departments, and all third-party vendors involved. As such, effective and consistent cross-functional communication between teams is crucial to providing seamless IT delivery. When it comes to the partnership between Service Desks and ALM teams, for example, transparent communication regarding asset data is key. If members of the Service Desk notice a high volume of similar performance issues with a specific laptop model, it is their responsibility to notify the ALM team. The ALM team can then perform root cause analysis to determine the source of the issue, which could have been an error in the imaging process or a hardware defect that caused the device to fail. Based on their findings, the ALM team can either resolve the issue with their imaging procedure or make an informed recommendation to their organization about new asset purchases to replace the faulty laptops. This kind of cross-functional communication not only leads to actionable decisions that will result in long-term asset performance improvements, but also ensures that ALM processes remain proactive. An effective ALM strategy goes beyond the methodology of asset management and delves into the more complex, logistical side of the process. From key software applications to inter-team transparency, successful ALM requires having sound fundamentals and best practices in place throughout the planning and execution of the process. After considering all that ALM necessitates, some organizations discover they don’t have the bandwidth or expertise necessary and explore outsourcing their ALM. Watch our video, Enabling Your Business With ALM, to learn how an experienced Managed Service Provider (MSP) can help you develop, implement, and optimize your ALM strategy to fortify your IT infrastructure and position your organization for scalability.